Kiddo Control: Or how not to lose your children in a theme park! Hi folks! I would like to welcome back our very first guest blogger Lori Potter. 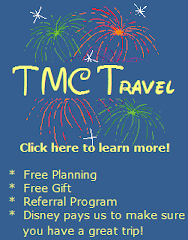 Since her first blog post with us, she has officially joined the TMC Travel family. Lori is a mom of four and has great experience travelling with a larger brood! New Innova Bed at Art of Animation. Is it a table or a bed? We have a family of 6, which according to Disney it makes us a large family. And because of that it makes our accommodation options at Disney a bit more limited. Thankfully Disney is finally realizing that more and more families have more than 2 kids and has just built the beautiful Art of Animation resort which adds a ton more family suites into their inventory at a more affordable price. So what are the on-property resort options for a family of 6? The most economical way to go is actually 2 rooms at a Value resort. If you are a family traveling together with one adult in each room then Disney will give you priority on adjoining rooms. If you don’t mind Value accommodations this is a great option. However, there are some more options if you want to all stay in one room. 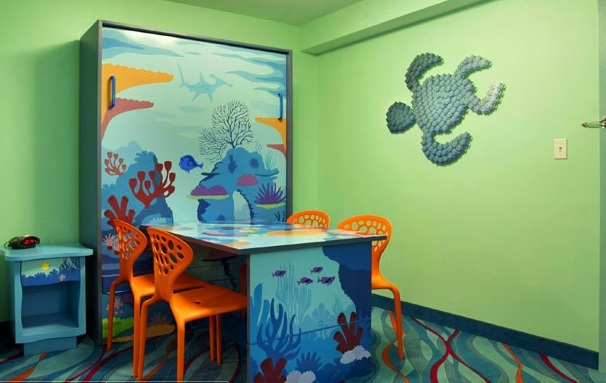 The Value resorts All Star Music and Art of Animation have Family Suites that are specifically designed for a family of 6. My family just stayed in a Family Suite at the All Star Music and we really enjoyed our time there. It is a Value resort so the doors open to exterior hallways and the linens are well, not as nice as some resorts but all in all it was a great fit for us. When you open the door you walk into the family room. There is a sofa (that turns into a double bed), a chair (which makes a twin size bed) and an ottoman (that folds out into a bed!). Off to the side there is a vanity area with good storage for suitcases and a bathroom. There is also a “kitchenette” which has a microwave, small fridge and a counter area. There is a bedroom (with a door) that has a double bed, TV and desk area. Across from the bedroom is another bathroom. So two bathrooms, beds for 6 and ample storage space! Our suite was in Jazz Inn 9. It was sort of in the middle of the resort. We didn’t have to walk too far to the pool or the main building which houses the food court and the bus stops. There was also parking close to our room which was convenient for us since we drove. Art of Animation is a brand new resort and will have a similar layout for their family suites. However, instead of an ottoman there will be table that folds out into a bed! A table! Can’t wait to see these in person and hopefully stay there at an upcoming trip. In the moderate resort category the Cabins at Fort Wilderness are a great option. The cabins are individual buildings set at the beautiful Fort Wilderness campground. They are equipped with a full kitchen, one bathroom, bedroom with a double bed and a set of bunk beds and a family room that has a pull down double Murphy bed. Each cabin also has a private patio. We love this option as we don’t have to worry too much about the kids being so loud they disturb neighbors. We also love having the bedroom for the kids so we can stay up later (well that’s the though anyways..we are usually more tired than the kids!). Fort Wilderness is a fun place to stay – there are always tons of activities going on around the resort like nightly movies and a Chip and Dale Sing-a-long by the campfire. It has a great restaurant – Trail’s End and a fabulous dinner show – The Hoop De Doo. Transportation can be a little bit of challenge – the resort is very large so there are buses to take you around to different spots around the resort as well as to the Disney transportation areas. It is a quick boat ride to the Magic Kingdom and you take buses everywhere else. If you are looking for a little more luxury in your resort stay Disney has several Deluxe Villas that will accommodate a family of 6. There resorts are part of the Disney Vacation Club are designed with luxury and comfort in mind. There are 8 villas that have 2 bedrooms that will fit a family of 6: Saratoga Springs, Beach Club, Boardwalk, Old Key West, Animal Kingdom (both Jambo and Kidani), Wilderness Lodge and Bay Lake Towers. Fair warning – these resorts can be very pricey and the two bedrooms at some of them (Bay Lake Towers) are pretty hard to come by since Disney Vacation Club members have priority for them. However, the villas are spacious, beautiful and very comfortable (and they have washers and dryers!). A great option if it fits your budget. These resorts all have full kitchens and at least 2 bathrooms. We’d love to help you find a great resort fit for your family of 6 or more! Call us today!! I could stop right there, but I think some supporting documentation is in order! As you may remember, a few weeks ago I left my sweet girls with my husband and skipped off to Florida for a "Girls Gone Goofy" cruise. I have to say, as I shared the news of my trip, everyone had the same initial response..."Without your KIDS?!?!" At my confirmation, there was one of two follow up responses..."Why do a kids cruise with another adult?" and "Good for you!" Since the ladder requires no further comment, I will address the former. 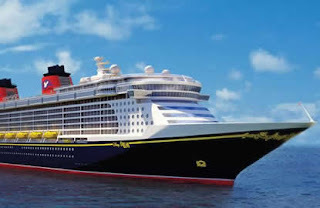 Yes, I did a Disney Cruise, without my children. Yes, I was on a boat with a lot of other children. No, this did not bother me in the least. You see, Disney knows that grown ups want to have fun, too. Whether you are with your kids and they ditch you for the kids clubs, or you are traveling sans kiddos there is so much to do! The check in process was a piece of cake! We arrived at the terminal, a nice gentleman took our non-carry on bags and scolded us to stop smiling. "Whadda ya think this is? The happiest place on earth, or what?" Cue bigger smiles. Before we entered the terminal, they did a quick check to make sure we had the proper travel documents. We stood in the shadow of the ship (it is HUGE...and BEAUTIFUL!) as followed a quickly moving line to enter the terminal. As soon as we entered the building we went through an "old school" style airport security check (keep you shoes on!) and headed up the escalator to the main part of the terminal. The terminal itself is cavernous, and very blue. We headed straight to the line to check in, and within minutes were cleared to board the ship. I did stop for a quick picture of Mickey standing in front of the model ship. As we entered the big yellow Mickey ears to board the ship, two lines quickly formed. One for pictures and the other to just get on the ship. Quick tip: Just get on the ship. There are plenty of other photo ops later. My first of many Mickey sightings! As we boarded the ship, our names were announced over a loud speaker..."The Disney Dream would like to welcome Ginger and Kelly!". We walked through a "tunnel" of smiling applauding cast members. While I knew that was part of their standard protocol, and that they do it for every family, I was surprised at how welcome it made me feel....like a total VIP! Immediately, we were impressed at the huge 3 story lobby, exquisitely decorated and crowned with the most amazing crystal chandelier. Is it me or does this look like a painting? As soon as we embarked, we headed right up to Cabana's for a great buffet lunch. We found a nice little table outside and enjoyed our lunch with a great view of the port and even the NASA launch pad. I had no sooner sat down when a cute waiter in white shorts appeared with a tray full of Bahama Mamas - the drink of the day. Cabana's proved to be one of my favorite dining spots! In general, your stateroom will not be ready until about 1:30pm. Since it was just before 1:00 we decided to wander around the ship and take lots of pictures. I quickly found what would be my favorite spot. (Head all the way up to Deck 13 and walk all the way forward.) It is a cool lounging bench that allows your legs to stretch out in front of you. And do you notice the little brown drink ledges? They thought of everything! After our impromptu ship tour we headed to our room. Since this was a bit of a budget trip, we opted for an ocean view room on Deck 2. It was a fairly small, but efficient space. It was great for a pair of friends. While technically our room would sleep 4, I think I would find it pretty tight sharing the space with 3 other adults or friends. I think it would be a cozy fit for a family with a few kids. The split bath was really nice. There was a toilet and sink in one room and a tub and sink in the other. This made it much easier for us to get ready. We unpacked our stuff and checked out the Daily Navigator. The Navigator is your daily calendar of events. It is your key to all shipboard activities. We noticed that they were offering a Spa Tour, so we headed on up! We finished up our Spa Tour in time for the Assembly or Muster Drill. It is quick, painless and absolutely necessary. We met at our assigned spot, our names were checked off a list and we were given instruction as to what to do in case of an emergency. If you want to get this done quickly SHOW UP ON TIME! I think we spent more time waiting on stragglers than we did on the drill itself. After the drill we headed up to the pool deck and enjoyed the Sail Away party. There are some catchy songs, some choreographed dances, and lots of characters. 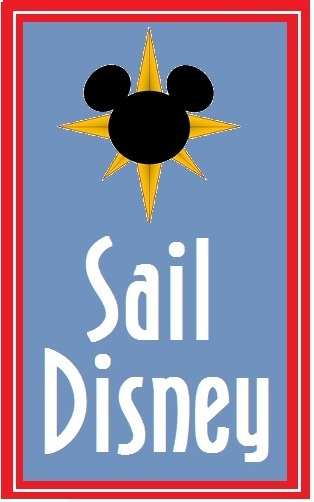 Before you know it, the ships horn blasts the first few notes to "When you wish upon a star" and you are off! At that point, the deck party continues with regular dance music and lots of movin' and groovin'. I have to say that pulling out of port felt a little disconcerting. You cannot feel any movement, so it seems as if the rest of the world is moving by. It is a bit of an odd feeling, but you get used to it quickly. Aided by the fact that you loose sight of land and all reference points fairly quickly! Since we had a VERY early wake up call around 4am, we decided to head down to our room, have a glass of wine, relax and get ready for dinner. Our dinner time was not until 8:15 and we were feeling a bit hungry. We decided to order a cheese tray from room service to enjoy as we got ready. It ended up being a GREAT decision, and one we repeated every evening. The first night of our dining rotation sent us to Animator's Palate. We enjoyed a little time with Nemo's friend Crush as we enjoyed a delicious dinner. I loved the theme of the restaurant, and the food was good, too! After dinner we enjoyed a few minutes of a lovely evening breeze and then headed back to our staterooms to turn in. We had a long but fun first day on board. When we returned to our stateroom, we found that our Stateroom Hostess had been busy in our absence. Our beds had been turned down, a chocolate treat was left for us to enjoy, and the next day's Navigator was awaiting our perusal. After a quick look and discussion of our plans for Day 2 we were off to Sleepytown! Stay tuned for "Girls Gone Goofy" Part 2!